The largest variations in brightness ever seen on a cool brown dwarf have turned up on the brown dwarf 2MASS 2139 (known as 2MASS J21392676+0220226 to its friends). The findings show a remarkable 30 percent change in brightness in a period of just under eight hours. The assumption is that brighter and darker patches of atmosphere are periodically moving into view as the brown dwarf rotates. These variations are evidence of a large storm system on the brown dwarf. Brown dwarfs are large objects whos mass range between planet sized and star mass where nuclear fusion can take place. Recent studies have indicated that interstellar brown dwarfs may be much more common than stars themselves. This makes sense in the general theme of smaller objects being more numerous. 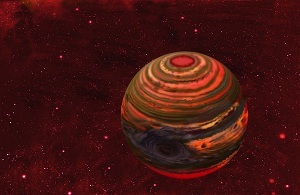 Older brown dwarfs can have atmosphere not unlike the jovian planets of sol sys. The mass of the brown dwarf would provide more than enough interior heat to keep the atmosphere of the brown dwarf active. Many brown dwarfs recently observed have been found to have atmospheric temperatures warmer than Earths, despite being in interstellar space. Brown Dwarfs represent a simpliﬁed case where atmospheric dynamics result primarily as a consequence of rapid rotation and internal heat, without the complication of external forcing due to irradiation from a parent star. In addition, the observation of weather on Brown Dwarfs extends the study of cloud meteorology to a higher gravity regime, never before probed. Studying the atmospheric actions of these objects could help us better understand out own atmosphere and that of our solsys members. Brown drawrds are fairly interesting for me because they are fairly numerous and could become interstellar way stations in the future. It is also quite possible that here may be brown dwarfs relativly close to our system (<4 ly) but have not been detected yet. NASA's WISE telescope has conducted a surevey of space that should be able to map locations of small brown dwarfs and detect any that are nearby. If there is a BD clser than 4ly it may have already been found but has not been announced yet due to the time it takes to search the data and process the results.